A freight forwarder, forwarder, or forwarding agent, is a person or company that organizes shipments for individuals or corporationsto get goods from the manufacturer or producer to a market, customer or final point of distribution. Forwarders contract with a carrier to move the goods. A forwarder does not move the goods but acts as an expert in supply chain management. A forwarder contracts with carriers to move cargo ranging from raw agricultural products to manufactured goods. Freight can be booked on a variety of shipping providers, including ships, airplanes, trucks, and railroads. It is not unusual for a single shipment to move on multiple carrier types. ‘International freight forwarders” typically handle international shipments. International freight forwarders have additional expertise in preparing and processing customs and other documentation and performing activities pertaining to international shipments. Information typically reviewed by a freight forwarder includes the commercial invoice, shipper’s export declaration, bill of lading and other documents required by the carrier or country of export, import, and/or transshipment. Much of this information is now processed in apaperless environment. Pembangunan + Korupsi = sesak + bencana ! JAKARTA, KOMPAS — Dalam 50 tahun terakhir, penduduk Pulau Jawa bertambah dua kali lipat. Jawa yang sedikit lebih luas dibandingkan Semenanjung Malaya harus menopang penduduk hampir lima kali lipat jumlah penduduk seluruh Malaysia.”Jawa masih menjadi sentral penduduk Indonesia karena infrastruktur di Jawa jauh lebih memadai dibandingkan pulau lain,” kata Kepala Lembaga Demografi Universitas Indonesia Sonny Harry B Harmadi, di Jakarta, Selasa (4/3). Pada 2010, Jawa disesaki 137 juta orang. Lebih dari separuhnya menghuni pesisir utara Jawa. Sisanya mendiami bagian tengah dan selatan Jawa yang infrastrukturnya lebih tertinggal dibandingkan bagian utara. Lebih dari setengah penduduk pesisir utara Jawa mendiami bagian barat pantai utara Jawa yang terbentang dari Cilegon hingga Cirebon. Perancangan wilayah multifungsi yang rakus membuat kawasan sekitar Ibu Kota tumbuh menjadi pusat pemerintahan, bisnis, keuangan, pendidikan, industri, sekaligus jasa. Pentingnya pembangunan infrastruktur pelabuhan untuk diikuti dengan infrastruktur pendukung lainnya seperti jalan, kereta, dll. 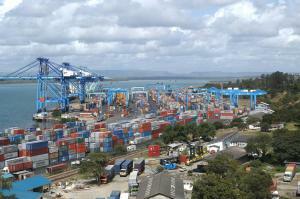 Art project commissioned by Ports of Auckland and Maersk to shed light on shipping industry. A 40-foot container emblazoned with artwork by famous street artists began its journey round the world. The Art Container began its voyage at the Port of Auckland, filled with New Zealand Greenshell mussels on board the Maersk Bratan, bound for Philadelphia. Commissioned by shipping giants Maersk Line and the Ports of Auckland, The Art Container project plans to promote the importance of the shipping industry. The container features designs by famous street artists’ Askew1 and Trust Me. One side of the container features a reworked version of Trust Me’s famous ‘Greetings from Aotearoa’, originally found in Ponsonby. 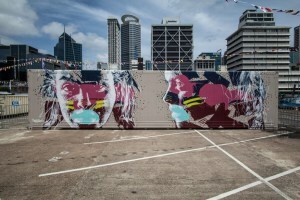 Askew One has supplied an original piece, titled ‘Gigi’ that covers the other.